Here is a map that (apparently) can only be consulted in the streets of New York. The classical pedestrian map, that lets you find your way, has been subject to an interesting approach in the American context, as in NYC people walk. From the way maps are oriented (not always with the north up, but taking into account the position of the beholder) to the design of the icons, an elegant work by Pentagram. 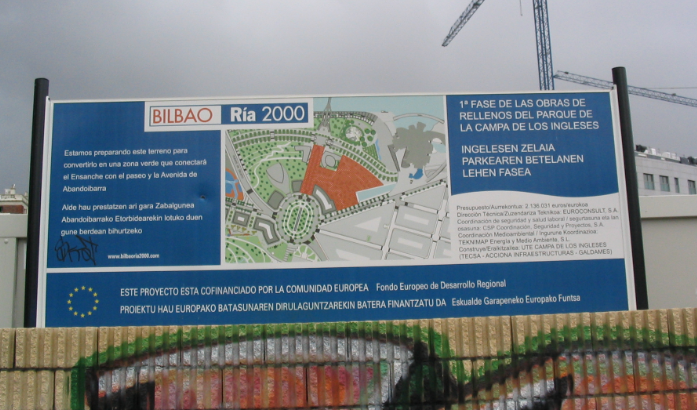 Bilbao Ria 2000, the public company established in 1992 with the presence of several administrations that has directed a substantial share of the urban transformation projects in Bilbao, invested in the city from 1997 to 2011 beyond 957 million euros (slightly above 1,3 billion US dollars), for a metro area not reaching 1 million residents. 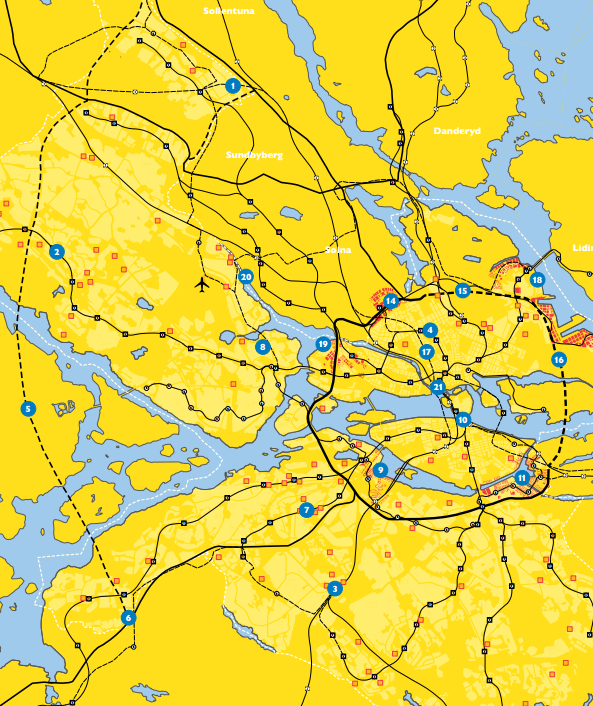 Its work has touched seven main areas: six neighbourhoods and the urban integration of a rail network that created substantial urban obstacles. These works have clearly improved the urban landscape, as well as the way Bilbao is seen abroad. Elias Mas Serra, former Head of the Architecture Board of the Bilbao Municipality (1991-2005) published in 2011 in the Bulletin of the Spanish Geographers Association an article about the management of Bilbao Ria 2000. The article is an analysis of a set of public policies that have been successful, but that raise some questions on which to reflect to improve future interventions: the problems derived from the asynchronous production of planning documents at different scales, as well as the need to ensure coherence between local and metropolitan scales in such projects. Monterrey has long had the image of the industrial powerhouse of Mexico. From the 1980’s there has been a tentative to build a more positive image, beyond smoke columns. 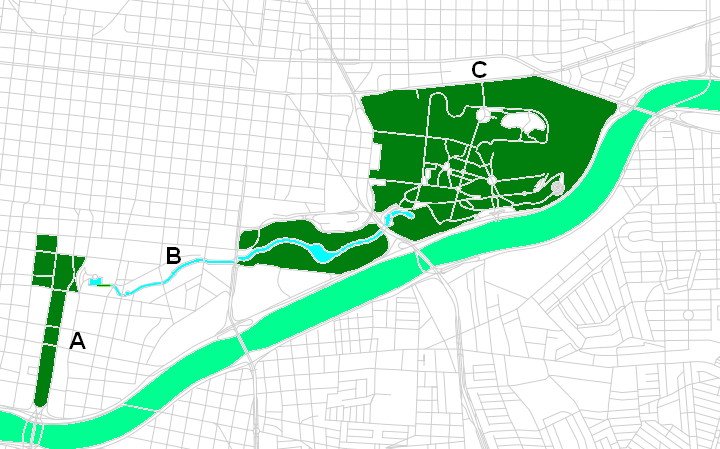 First it was the Macroplaza (some 500 m of gardens connecting the main power centers and the classical museums, not unlike some US squares in a typology quite different from European Squares), and the the Parque Fundidora, an old steel mills site which has been turned into a park. Since the mid 1990s there has been a series of works to revive the canal de Santa Lucía, an ancient small river that has been turned in a navigable channel and linear corridor connecting both spaces; the Rio Santa Catarina, which is the main water course in the city, has been transformed in a linear park, but seems less well cared for . According to many sources, these possitive investment in public spaces have not been in parallel with much needed improvements in basic urban facilities in most of the urban tissue, as it has been the case in other cities also confronting a productive transportation (cities located in richer countries, no doubt). Metropolitan Lille concentrates one of the largest sets of brownfields of the whole France. This means as much an urban problem due to the jobs and active urban uses loss in a context in which some areas are like a “sprawl by disappearance”, as an environmental one, due to industrial pollutants in the soil after years of industrial production. 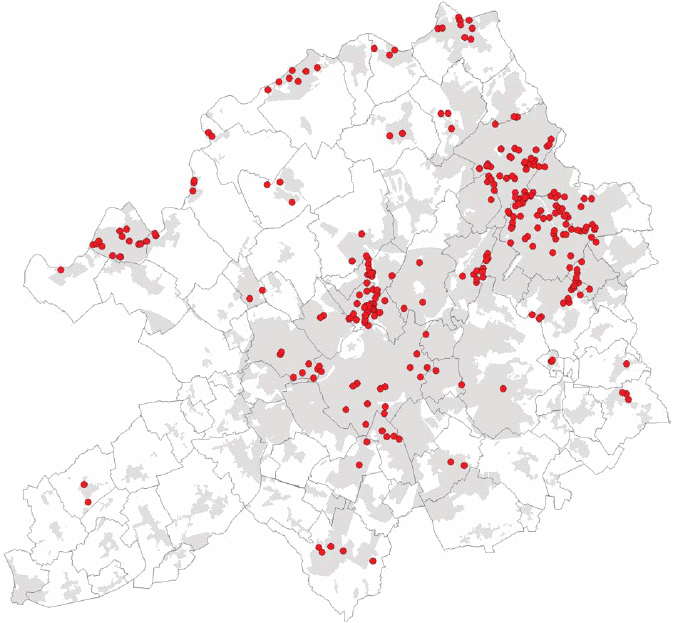 In june 2010 Lille Metropole published a report on these brownfields and their pollution situation. Every aspect is analysed, from the spatial distribution of this problem to the national policies or the foreign experiences (with special interest in Flemish and USA cases), with a proposal of guidelines to tackle the issue from the urban planning scene. It is an interesting publication on a matter concerning more cities than usually expected. Mexico is a giant country: a straight line from Cancun to Tijuana measures about 3.200 km, about the distance from Lisbon to Helsinki or Mumbai to Bangkok. And there can be an impressive distance between neighbouring streets when it comes to quality of life. The Sectorial Programme for Agrarian, Territorial and Urban Development, published in December 2013, lays out the policies that the 2013-2018 administration pledges to apply in these domains. The United Nations Environmental Program, ESRI, Google and environmental groups have launched Global Forest Watch, a website that tries to track in real time the deforestation and forestation dynamics around the world. It is a premiere, with some room to kvetch: for instance, an industrial palm plantation (for an ecologist as speculative an investment as a golf course) is not discriminated from an old forest full of biodiversity. But it is, anyway, an interesting source. Usually a city can owe its industrial basis to a entrepreneurial population or to the arrival of external entrepreneurs. Even when most of the western countries have most of their jobs and revenues generated by small and mid-size businesses, what moves the newspapers titles is the ability of a city to lure large, well known firms, to come to their place to invest. The factory opened its gates in 2011. In February 2014 it has been the centre of a strong debate on unions, something in Europe would sound rather strange; in fact, Volkswagen was (according to the press) not opposed, but it was rather an American right-left battle waged as a part of a larger conflict in the south. To an European eye it is puzzling to see Tennessee republican legislators accuse Volkswagen (a private company) of favouring a given union and threaten to remove incentives if that union was to win (http://www.freep.com/article/20140210/BUSINESS0104/302100100/volkswagen-uaw-chattanooga-tennessee-republicans ). 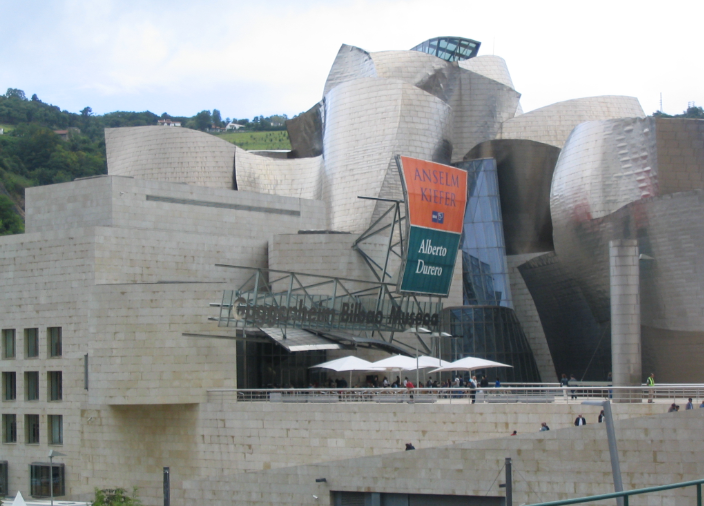 In Bilbao, the investment in the Guggenheim shows parallels. The incentives given to ensure the presence of the Guggenheim museum can only be understood taking into account that the Provincial Government of Biscay has a special fiscal regime, on equality with the Spanish tax agency (and clearly because Biscay is a rich province). How do you attract a large brand, whose image is far from the one your city currently sports? By looking for a brand that wants to widen its scope, and providing advantages: a good location, a coherent city project to grow… and consequent public help. Seen from the other side, if the project works, there are chances for synergy for other business in the area, even if there can be exclusivity agreements (Eurodisney in Paris, for instance) on some zones; but these benefiting from the synergies will have to pay full taxes. To be sure, during the XIXth century, there were not such aids; but taxes were lower, as much as environmental protection and other things now judged as unavoidable. To which extents do such deals are fair and acceptable? In a democracy, transparency must be there, and election votes should be relevant, but there is a need to hear the citizens during negotiations. 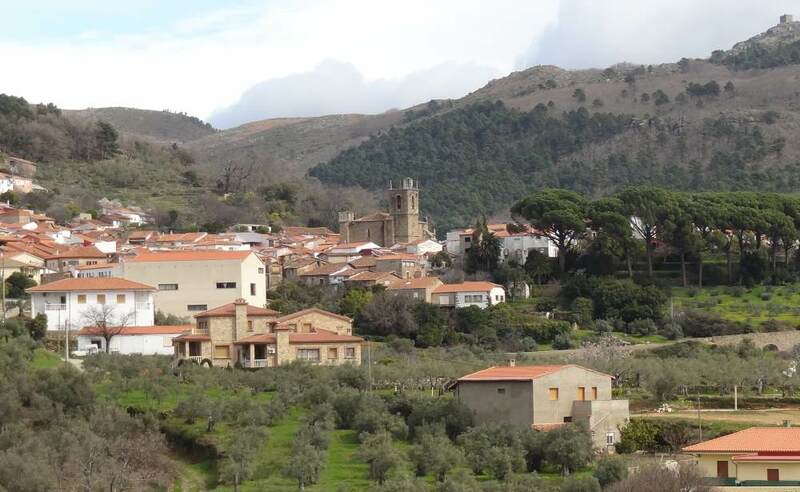 To be honest, the title here is not entirely accurate: I knew about the landscape interest of Gata (Cáceres, Spain), and in fact I was in a visit preceded by a quite complete briefing. The unexpected being here to which extent I liked how the different elements fit. And largely, the pines to the right of the church in the first image, just a handful, but clearly leaving a good imprint on that landscape. Lille grew by a combination of industries, mainly the textiles ; Bilbao and Monterrey were clearly two steel cities, and Chattanooga, as Glenn Miller reminds in his song, grew by the rail. When industries got into trouble and pollution was deemed horrible (Bilbao and Chattanooga were not helped by scenic, but impractical hills for that matter), they became problem cities. What is interesting is to see how they avoided becoming a Detroit (whose story is still running…).